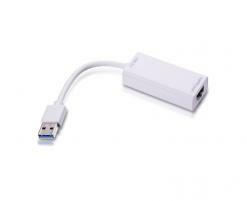 While there are a lot of similarities between USB network adapters on the market not all are alike. Some are of poor quality and fail after very little use, some only provide half the advertised speed due to bus limitations (USB 2.0 "gigabit" adapters), and others deviate from standards or include proprietary software components that can cause problems for end-users. Considering how long USB gigabit adapters have been around you might have thought that we would have had such a product in our catalog for a very long time now. Well, you would unfortunately be mistaken. Until recently we had kept our eyes open and continued to test and research different chips and gigabit adapter designs- but nothing ever met even our minimum expectations and standards and so for years we have reluctantly refrained from selling any USB gigabit ethernet adapters. Fortunately things don't stay the same forever and so today we have added a new USB 3.0 Gigabit Network Adapter to our product catalog. This adapter provides optimal speeds while retaining a high degree of quality even under extreme use cases. Even after two days of maxing out the connection with 20TB of data we just couldn't get this adapter to die. Comparatively speaking of the several dozen USB network adapters we've checked out over the years few have held up to our extensive testing both in terms of support and quality.